This would mark Lon Chaney Jr.’s final role as Kharis. He previously played the title role in “The Mummy’s Tomb” (1942) and “The Mummy’s Ghost” (1944, which was released the same year as “The Mummy’s Curse”). 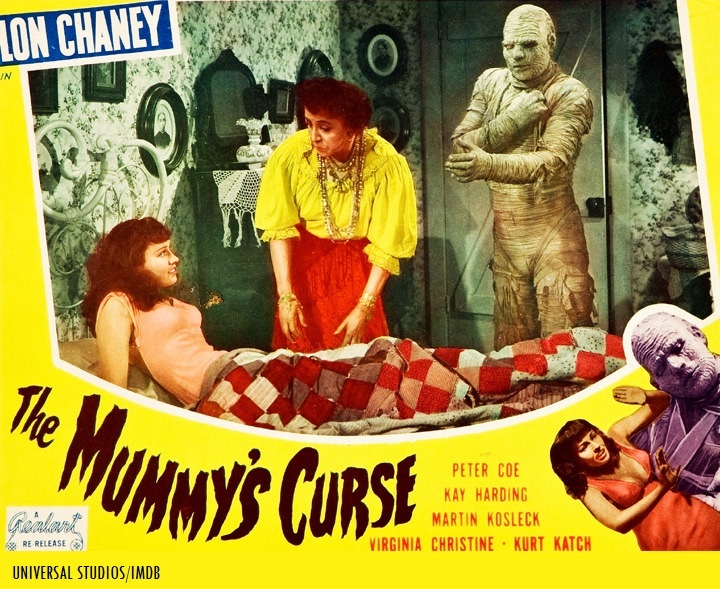 The fifth Universal “Mummy” film would also mark the final appearance of Kharis. Two years later, Virginia Christine would play the role of the lady of the streets in the 1946 Universal horror thriller, “House of Horrors” with Rondo Hatton. She would later play “Mrs. Olson” in commercials for Folger’s Coffee in the 1960’s. According to the American Film Institute’s database entry on the fifth Universal “Mummy” film, several “flashback” sequences from “The Mummy” (1932) and “The Mummy’s Hand” (1940) were used in “The Mummy’s Curse.” According to IMDB, the flashback sequences featured Boris Karloff (in his role of the “Mummy” Imhotep in the 1932 feature) and Tom Tyler (in his role of the “Mummy” Kharis in the 1940 feature). Jack Pierce’s “Kharis” mask for Lon Chaney, Jr.
Kurt Katch and Lon Chaney, Jr. in “The Mummy’s Curse” (1944). The “Mummy” mask that was designed by veteran Universal Studios make-up artist Jack Pierce (for the junior Chaney’s role of Kharis in “The Mummy’s Curse”) is one of the few surviving examples of Pierce’s Universal monster make-up designs. The Pierce “Kharis” mask for Lon Chaney, Jr. was preserved by horror/sci-fi film historian Bob Burns, according to IMDB’s trivia section. The mask is now on display at the Museum of Pop Culture (“MoPOP,” the former “Experience Music Project Museum”) in Seattle, Washington. A “Kharis” dummy publicity gimmick for the (now-defunct) Peru Theater and their Halloween 1945 screening of “The Mummy’s Curse” (1944) in LaSalle, Illinois. 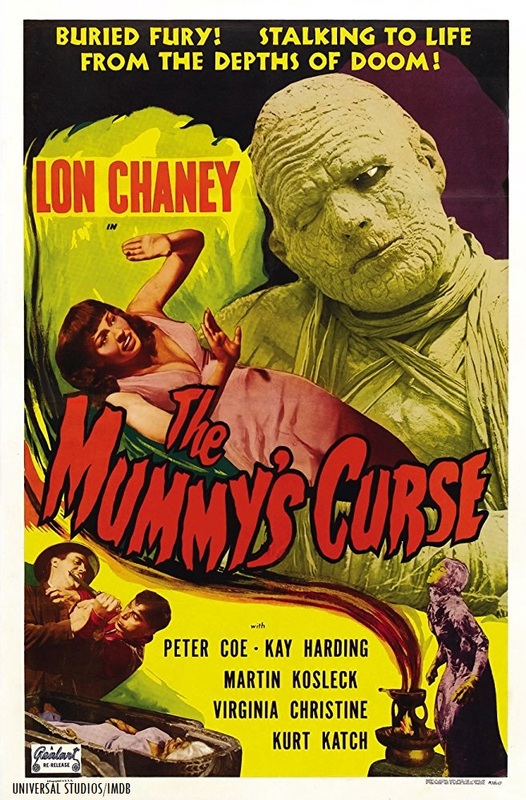 Produced and released by Universal Studios in late 1944, “The Mummy’s Curse” was also released to cinemas in 1945. 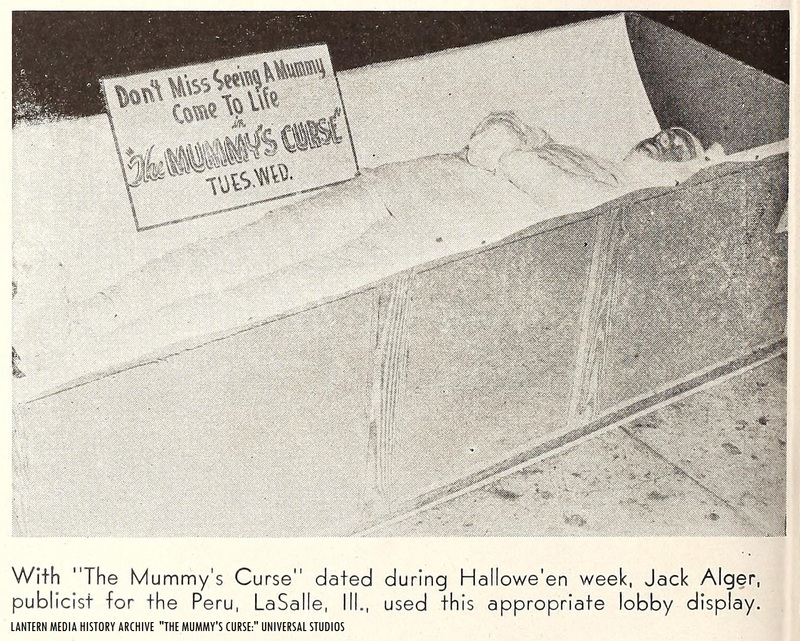 According to recent research on the Lantern Media History Archive, a Halloween “Mummy” display (featuring a Kharis dummy display) was constructed by Peru Theater publicist Jack Alger in LaSalle, Illinois. The theater showcased the film in Oct. 1945. Be sure to watch (or record) Svengoolie and wrap up with “The Mummy’s Curse” (1944), this Sat. on Me-TV! Berwyn’s duo of the Me-TV airlanes! Svengoolie (portrayed by Rich Koz) and Mr. Kerwyn! With a cast of recognizable faces, Sven’s extended fun facts, Doug Graves’ musical interlude and Kerwyn’s “mail call,” and final on-screen appearance of Kharis, you won’t want to miss out on Sven’s showcase of “The Mummy’s Curse” this Sat. on Me-TV! One of many iconic Universal monster thrillers of the silver screen (highly recommended)! Have some fun with all fellow #Svengoolie SvenPals everywhere during Sven’s Sat. showing of “The Mummy’s Curse” (1944) on Me-TV (via Twitter)! 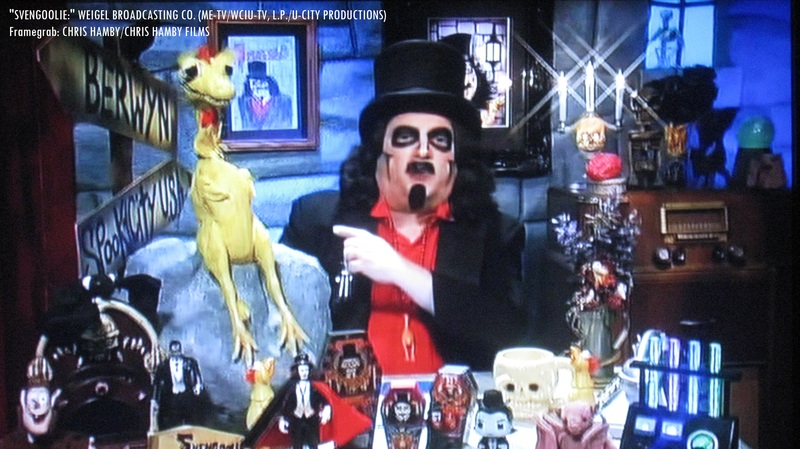 Svengoolie and comedian Dana Gould (of “Stan Against Evil” fame, from Sven’s May 2015 broadcast of “Man-Made Monster” on Me-TV, via Dave Fuentes’ “Terror From Beyond the Daves” YouTube channel). Sven’s alter-ego, Rich Koz and his recent appearance on comedian Dana Gould’s “The Dana Gould Hour” podcast (the “Aging Disgracefully” episode is now available)! Svengoolie’s alter-ego, Rich Koz recently made a guest appearance during Dana Gould’s recent touring stand-up comedy show with comedian Emma Arnold at Zanie’s Comedy Club in Rosemont, Illinois in Nov.! Sven (his alter-ego, Rich)’s appearance with Dana and Emma begins at the 2:35:13 mark. Note: Some parts of Dana Gould’s podcast may not be suitable for younger audiences, listener discretion is advised. Dana Gould (as Kevin) and John C. McGinley (as Stan, from “Stan Against Evil”) also made a cameo appearance in Sven and Freddy “Boom Boom” Cannon’s 2016 music video of “The Svengoolie Stomp” (the hit song/music video recently returned to the Me-TV airlanes during Sven’s showcase of “The Frozen Ghost” last Sat.)! Svengoolie’s upcoming “Sventa Claus” meet and greet appearance at Dreamland Comics’ new location at Stratford Square in Bloomingdale, Illinois (Sat. Dec. 9 from 1-3 p.m. local time, 152 Stratford Dr, Bloomingdale, IL 60108)! “The Mummy’s Curse” (1944) is alao available on Universal’s “The Mummy: The Complete Legacy Collection 1932-55 (six film set) on Blu-Ray and DVD and is also available on digital download and on demand (from select providers/retailers). 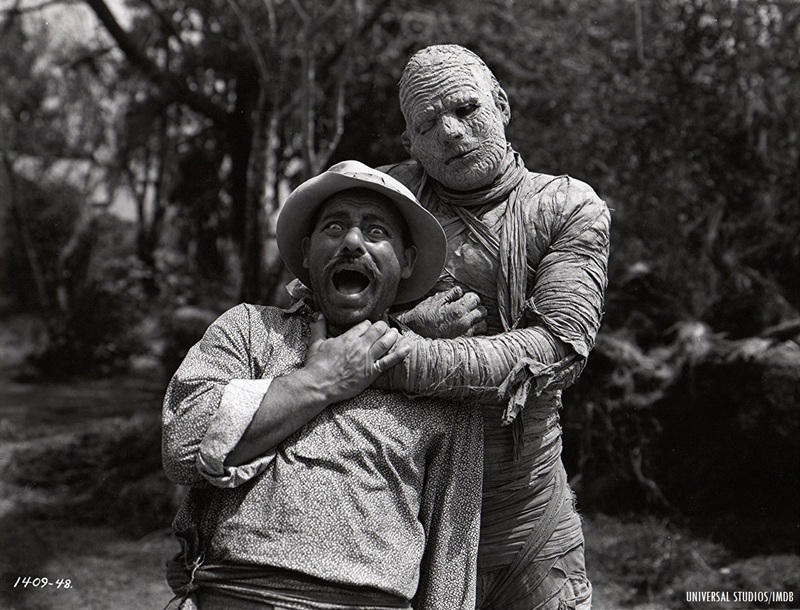 The film is also available in Universal’s double-film “Mummy” DVD set with “The Mummy’s Ghost” (1944). Questions/comments about “Svengoolie” or “The Mummy’s Curse” (1944)? Drop a line at the comments section! I find it fascinating that of all the Universal Monster Franchises, The Mummy films are the only ones that haven’t aired at least 3 times (except “The Mummy’s Ghost”) on Svegoolie on MeTV (since I’ve been watching – October 6, 2012). All the Frankenstein, Wolf Man, Dracula, Invisible Man and Gillman films have aired on Svengoolie 3, 4, and – in the case of “House of Frankenstein”, “The Bride of Frankenstein”, “The Wolf Man”, “Revenge of the Creature” – 5 times! I’m not complaining about this, as the classic three – Frankenstein, Dracula and The Wolf Man – are my favorite Universal films and I can watch them over-and-over again! I also own the Unviersal Legacy DVDs and watch those when I need a classic Monster fix. I know the Mummy films are not as well regarded as some of the other Unviersal Monster films, particularly Tomb, Ghost and Curse, but I love them just as much – and in the case of some of the lesser Dracula and Invisible Man sequels – even more! I know Svengoolie has stated many times, he and MeTV have no control over when each Universal title is aired, but I do think it’s intersting that Universal has chosen The Mummy films to give the least number of airings to on Svengoolie. Here’s hoping that “The Mummy” 8/18/12, 11/8/14 (2), “The Mummy’s Hand” 8/10/13, 12/26/15 (2), “The Mummy’s Tomb” 8/17/13, 6/10/17 (2), “The Mummy’s Ghost” 12/7/13, 12/16/14, 12/31/16 (3) and this Saturday’s Movie “The Mummy’s Curse” 5/25/13, 12/9/17 (2) will find themselves in more of a regular rotation on Svengoolie in the future. Greetings, Gregory! Fascinating observations on the rare airings of most of the Universal “Mummy” monster franchise films on Sven’s Me-TV showcase (same here, sir)! Wonder if it has to do with certain contractual obligations (between Universal and Me-TV for the vintage Universal monster/horror/sci-fi/mystery films on Sven’s show) or just another mystery of modern TV syndication for certain feature film packages (or something unknown)? This might also apply to some of the pre-1948 Paramount horror/fantasy/mystery features owned by Universal (as a result of MCA’s late 1950s acquisition of the pre-1948 Paramount sound feature film library for TV) that have aired on Sven’s Me-TV showcase as well. Must have been different for previous syndication packages of the Universal monster/horror/fantasy classics for local stations many years ago (including the “Shock!” and “Son of Shock!” syndication packages from the late 1950s, when Universal leased the TV rights to their pre-1948 feature film holdings to their competitor, Columbia’s “Screen Gems” TV subsidiary before MCA/Universal re-acquired the broadcast/syndication rights to the pre-48 Universal features in later years). Fingers crossed that there might be more Universal “Mummy” films that will air on Sven’s Me-TV show throughout 2018 (depending on what Universal gives Me-TV to air on Svengoolie’s show for the film contract)! Glad you enjoyed my article on “The Mummy’s Curse” (1944)! See you and all fellow SvenPals throughout the land this Sat. evening for Sven’s showcase of the final Lon Chaney, Jr. Universal “Mummy” (Kharis) feature on Me-TV (a Sat. evening tradition of Sven and his weekly offering of the Universal monster/creature/sci-fi/mystery classics)! Kudos to you and all of the fellow Svengoolie SvenPals and classic/vintage/cult monster/horror film enthusiasts out there! Peace/cheers!